It’s another bona fide hit for South Pasadena Educational Foundation’s annual 5th grade musical and a hundred or so families across all three elementary schools in town as they opened their delightful production of Willy Wonka Jr.
PHOTO: Eric Fabbro | SouthPasadenan.com News | Willy Wonka Jr.
Each year the 5th grade musical is a huge undertaking with volunteers pitching in on costumes, make-up and hair, publicity, props and of course months of managing rehearsals and all logistics to bring together students from Monterey Hills, Arroyo Vista and Marengo Elementary to collaborate on a full-scale musical. 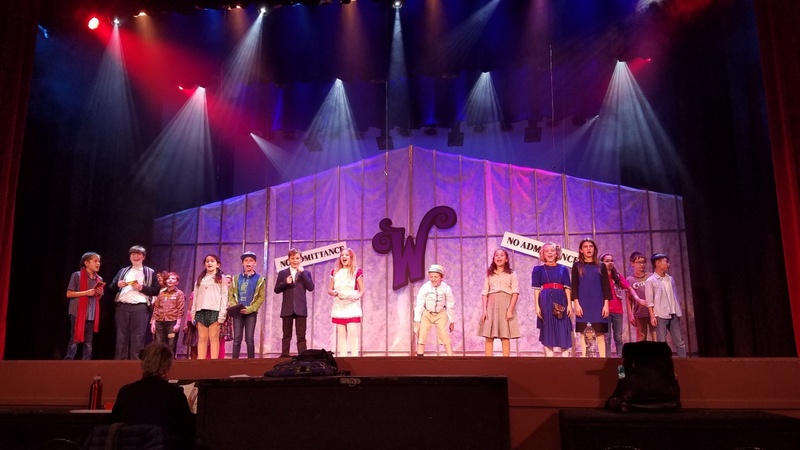 The beauty of it, year after year, is not just highlighting the fantastic talent in town, but also to see these students, some of whom have never been on stage before, move out of their comfort zone and as SPEF President Megan Dostal said, “learn life skills from auditioning, learning lines, learning to sing and dance while staying on top of their schoolwork, how to support each other and most of all learning to be a part of a team that isn’t on a field.” In addition to all of the participating families, Dostal expressed gratitude to the team at Upstage for their collaboration and to James Jontz and the student crew of South Pasadena High School. 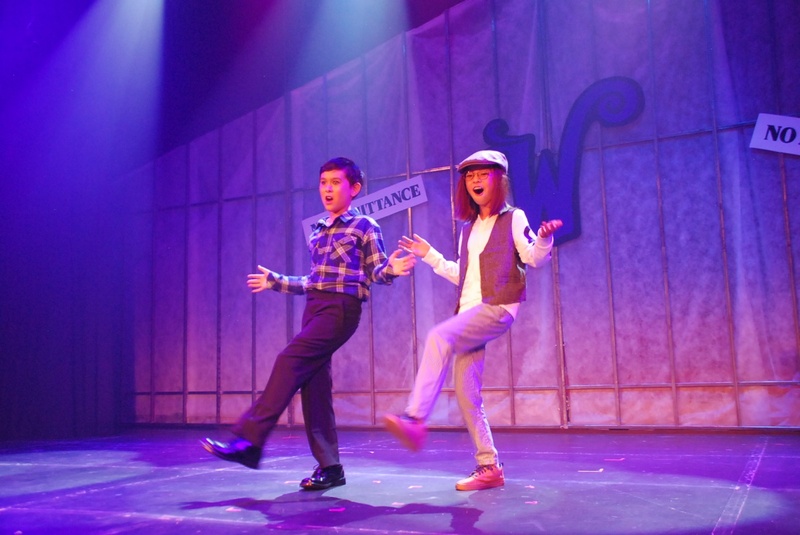 It was literally standing room only as the enthusiastic crowd sat in anticipation for the show to begin. 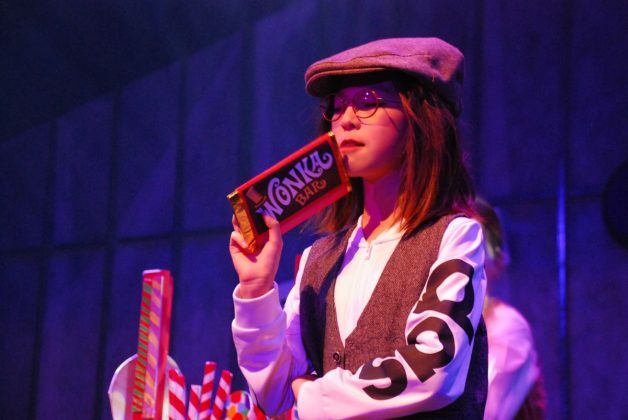 Everything you remember from Willy Wonka is here in this fun Jr. version from Charlie Bucket and his eccentric family with both sets of grandparents bedridden, the Candy Man, Slugworth, the bratty golden ticket winners and lots of oompa-loompas. 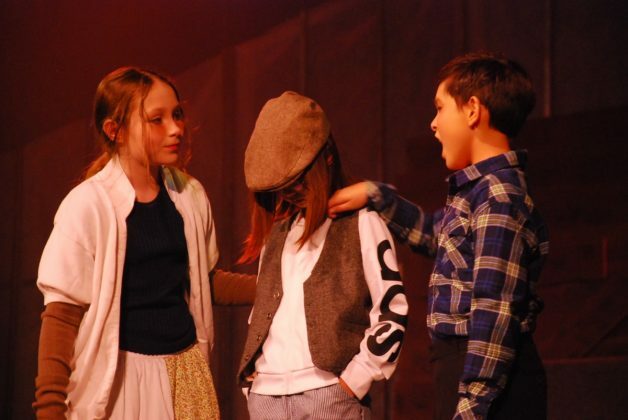 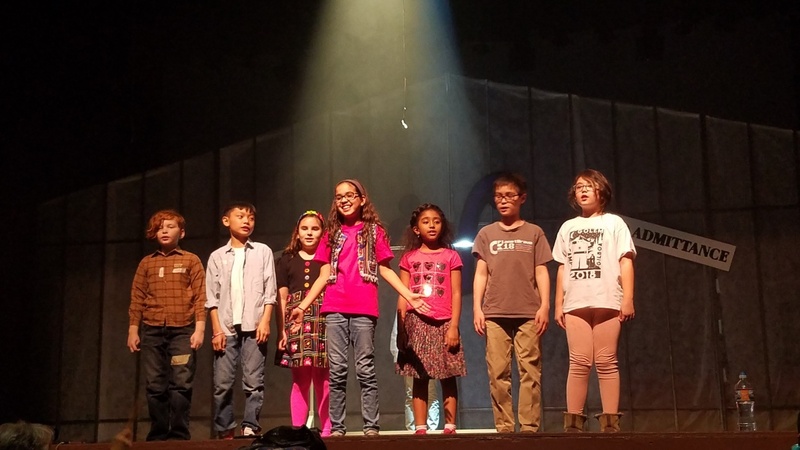 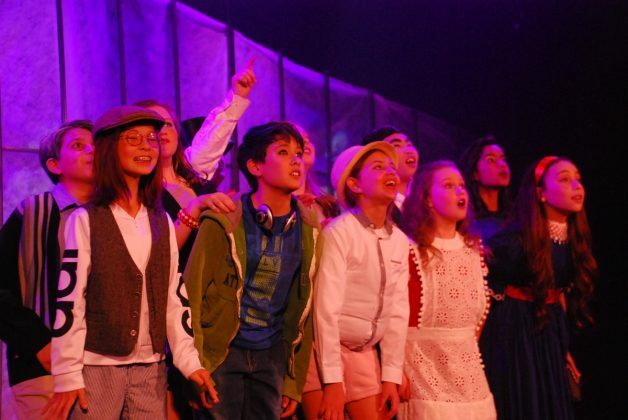 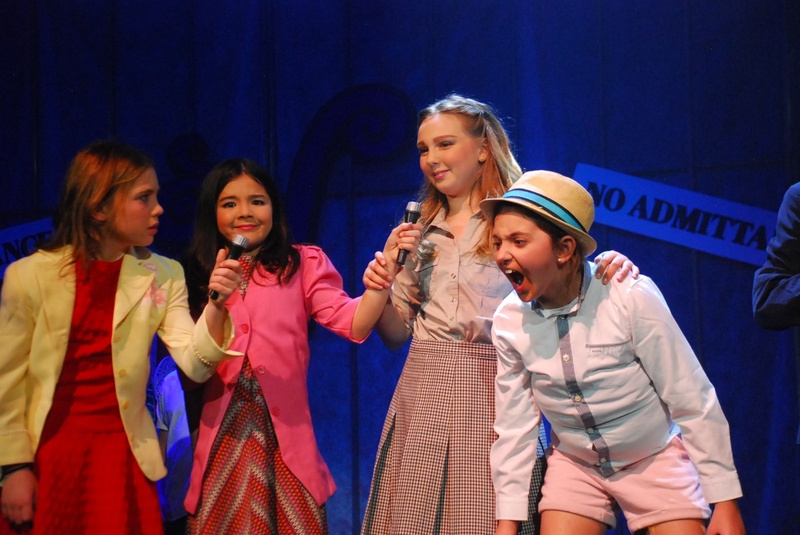 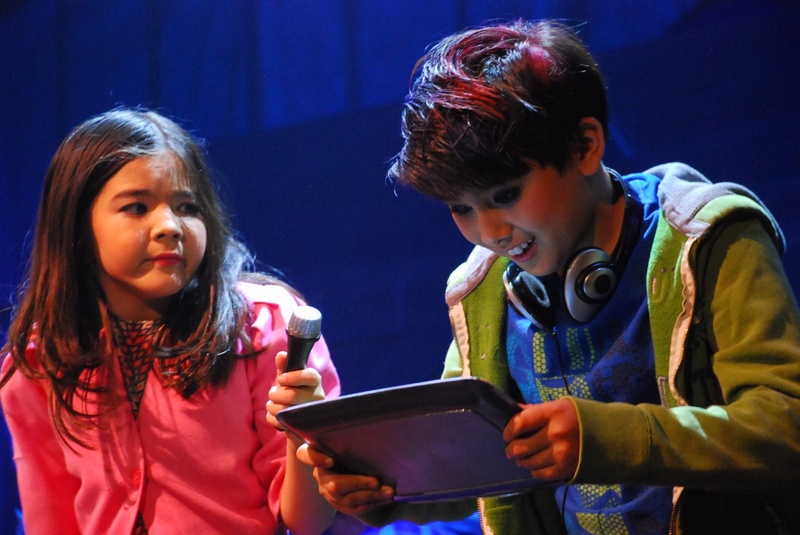 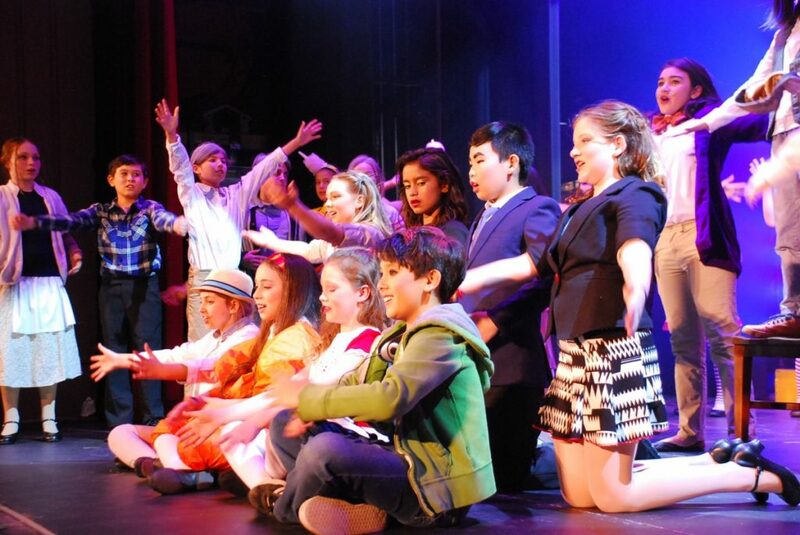 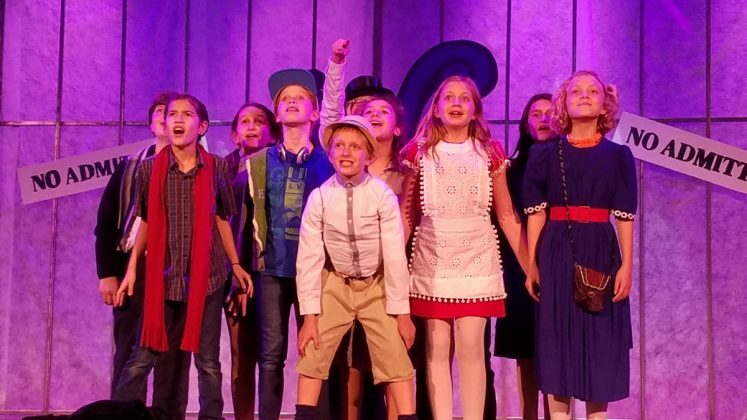 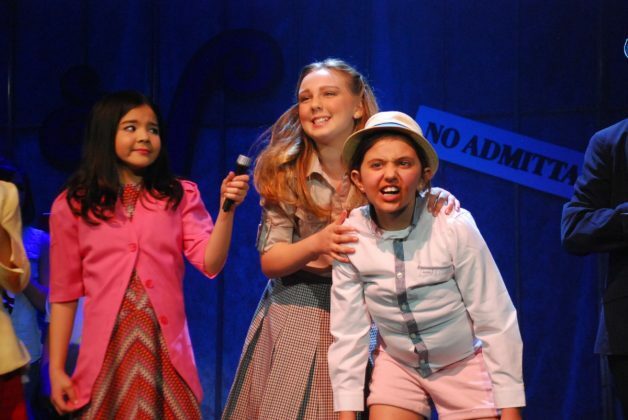 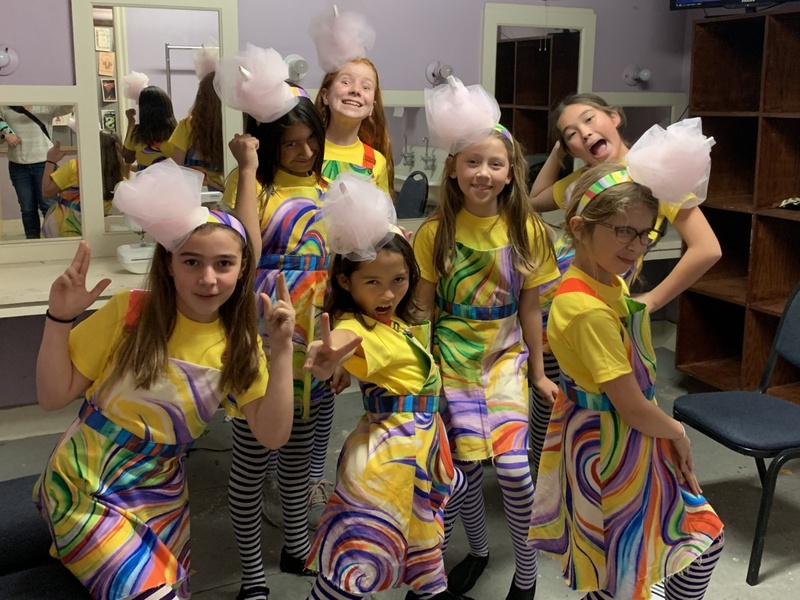 The kids do an absolutely marvelous job, all singing for the back row, with the vivacious Cinbie Chang and the darling Emma Jay Johnson in the lead role of Charlie. 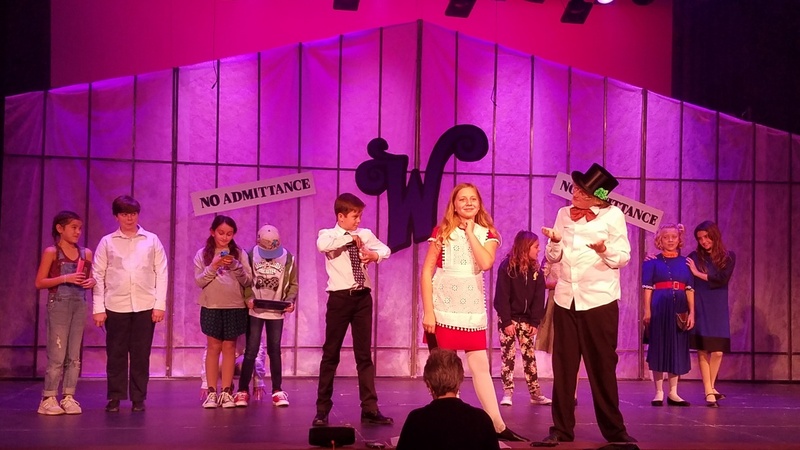 “I’ve Got A Golden Ticket” is a standout and try not to smile as Ethan Masjeti and Jack Grotenstein as Grandpa Joe sings and dances to “Think Positive” with Charlie. 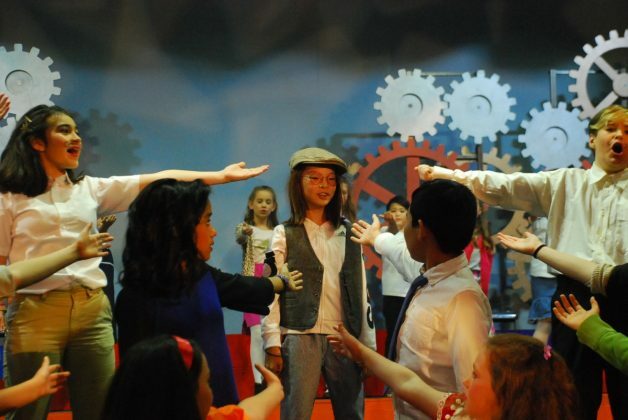 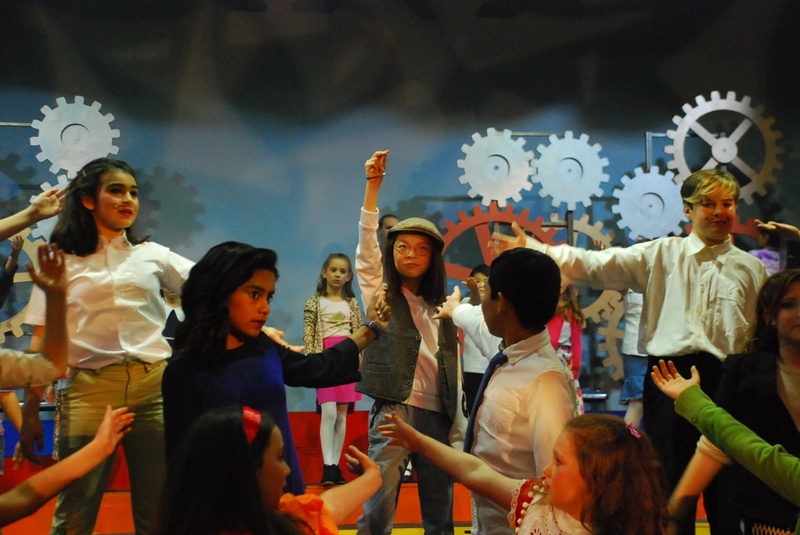 Jarvis Wood, Ava Dawson, Miles Talbot, and Molly Tosta bring energy, quirkiness and a sense of danger to the role of mysterious factory owner, Willy Wonka. 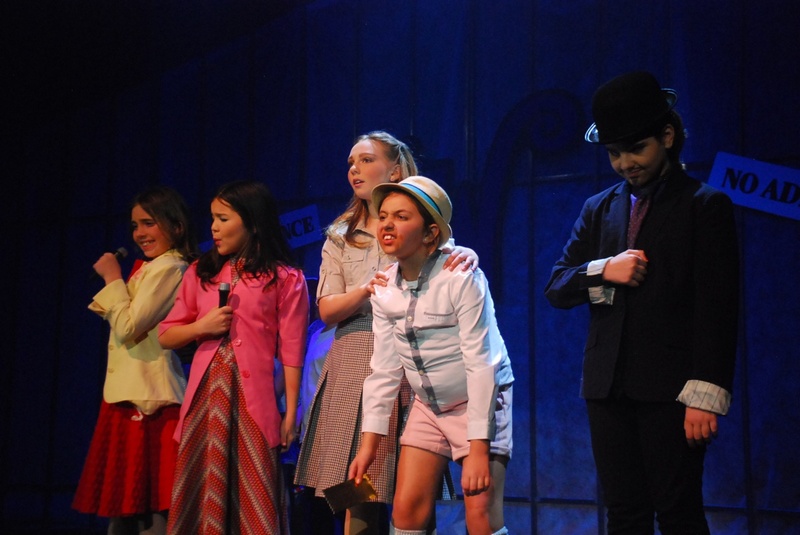 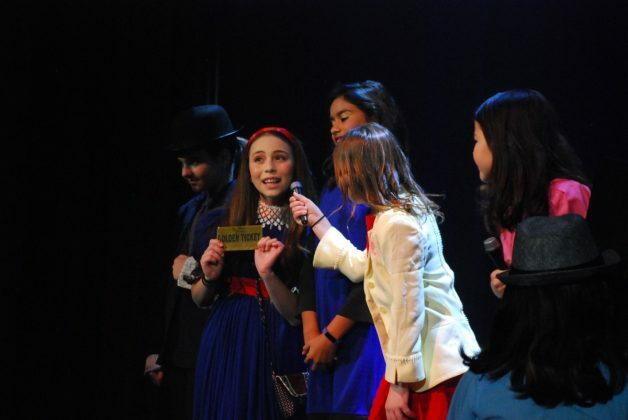 Kaitlyn Lowstutter is wonderfully bratty as Veruca Salt while Dina Zangwell brings her own sassiness to the role. Gwyneth Daley is hysterical as Augustus Gloop and Kai Tilley is having a ball as the gluttonous German boy with Revelie Brick and Andreya Wilgoren doing a bang-up job with the German accent as Mrs. Gloop. Viviana Williams and Adelaide Bertolina are cheeky as Violet Beauregarde, the gum-chewing smart aleck and the moment she turns into an actual giant blueberry is a fun, theatrical feat. 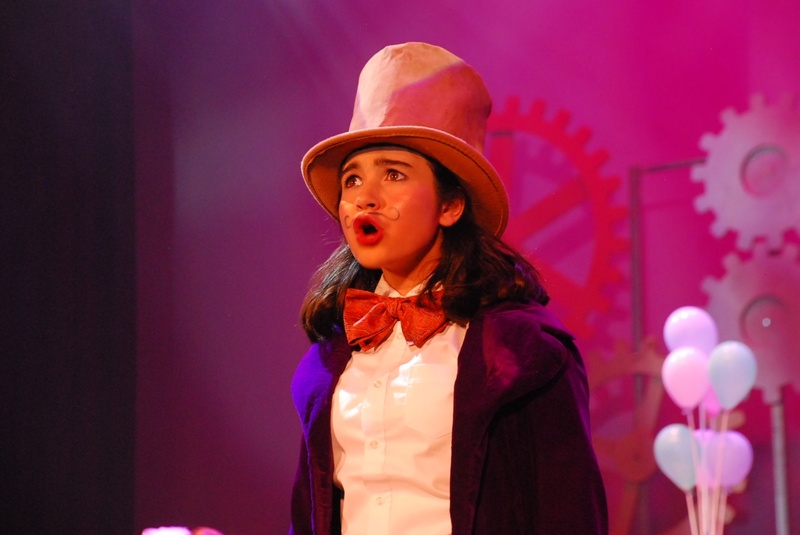 Kudos to production for that great bit of stagecraft. 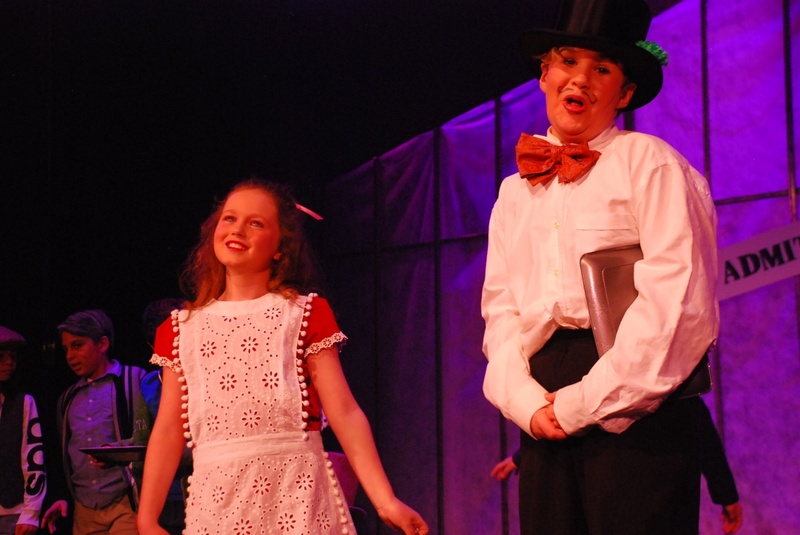 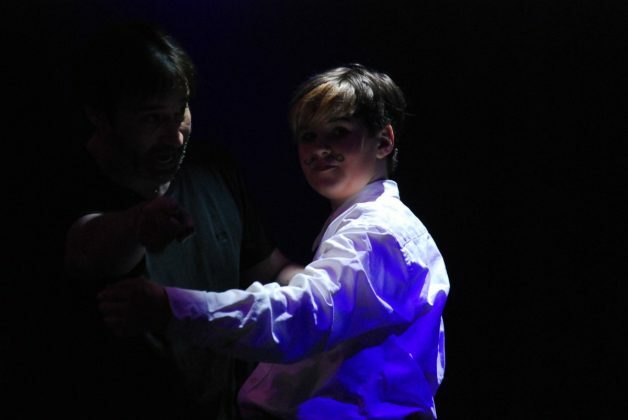 Griffin Matlock is an exuberant Mike Teavee and Lily Shaffer brings her own brash intensity to the role. 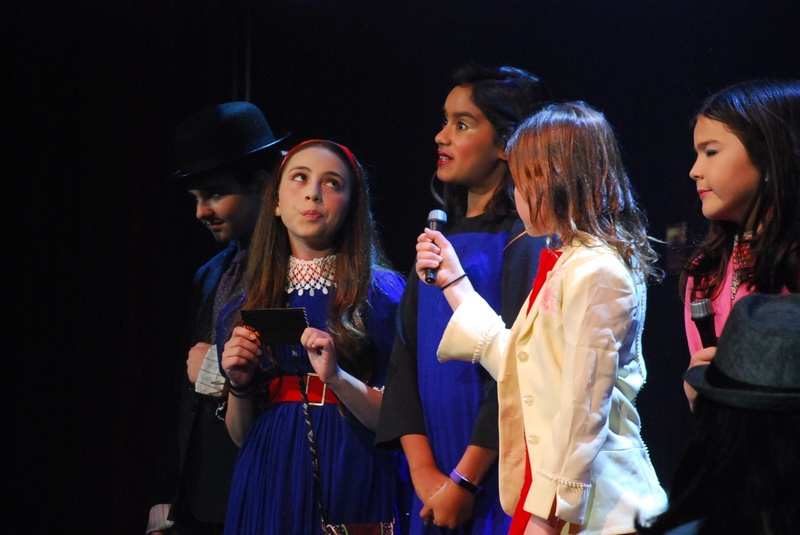 The rest of the parents are played with the perfect amount of exasperation by Mason Asakura, Peter Leeson, Lucy Hansen, Mina Mannal, Sofia Agredana, and Clementine Cooley. 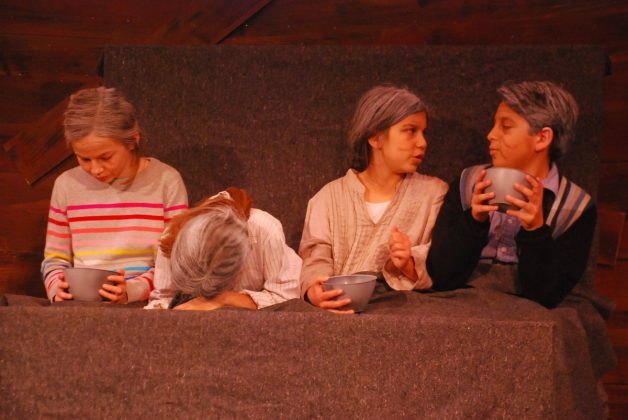 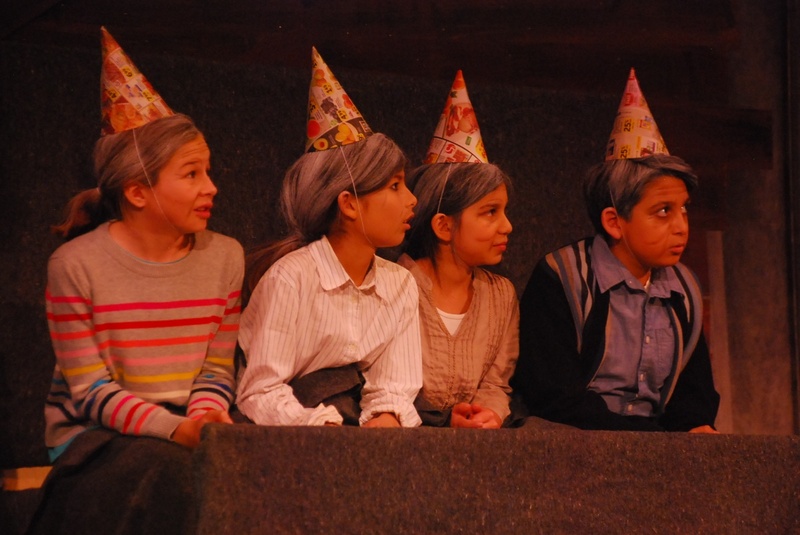 The hysterical grandparents (always a kick to see 5th graders playing old folks) are played gleefully by Mailani Platt, Raith Kawai, Mylena Ramirez, Milla Sanchez, William Gervigian, and Aislinn Meza. The sweet Mrs. Bucket is played with tenderness by Audrey Berkobien and Francesca Carmona. 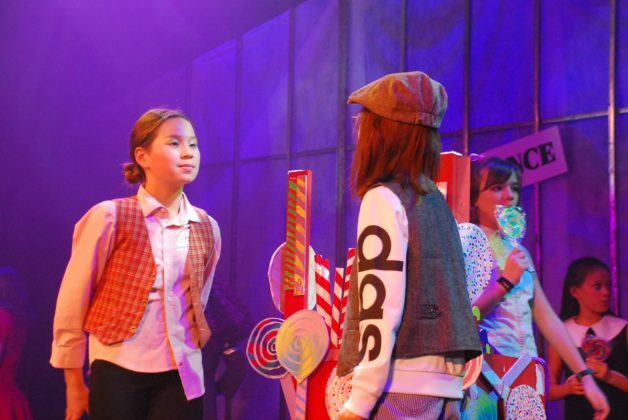 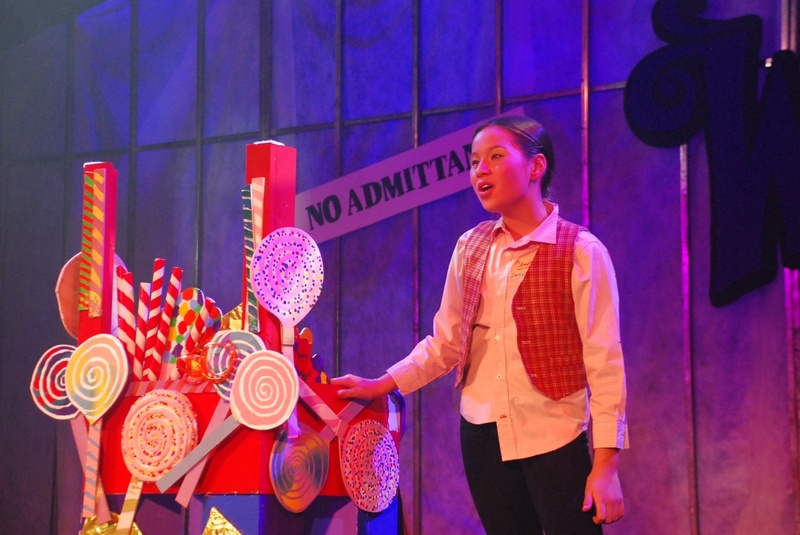 The friendly Candy Man is played with great charm by Amaya Mahler and Anaya Quinonez. 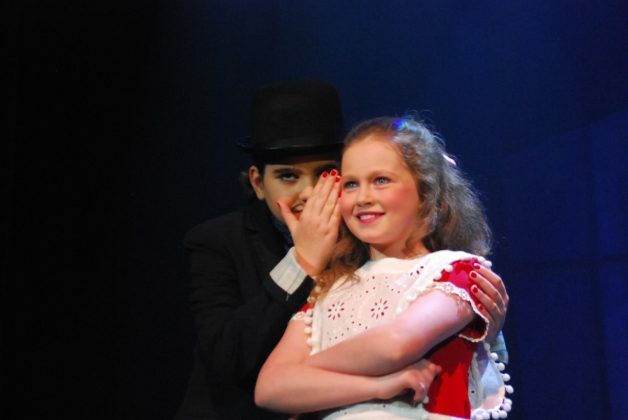 Both Beatrix Aboud and Kyle Kirchen make the most of the sneaky Slugworth. 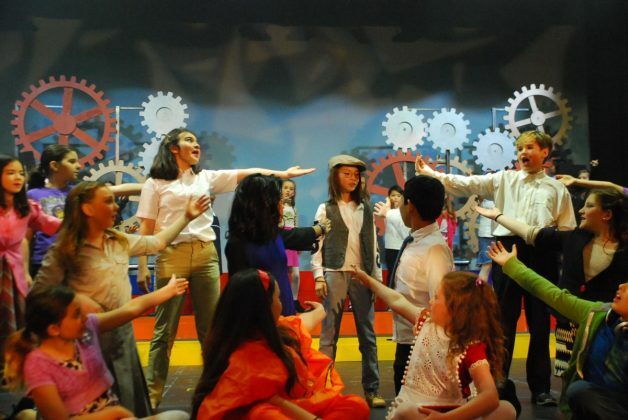 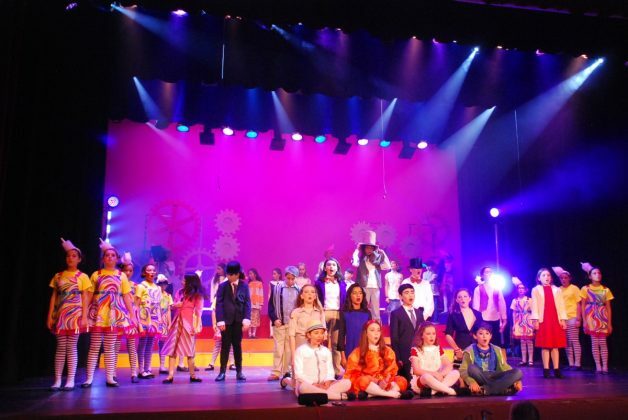 The rest of the cast does a fantastic job of filling in all the roles of reporters, cameramen, school children and of course a charismatic and judgmental group of Oompa-Loompas! 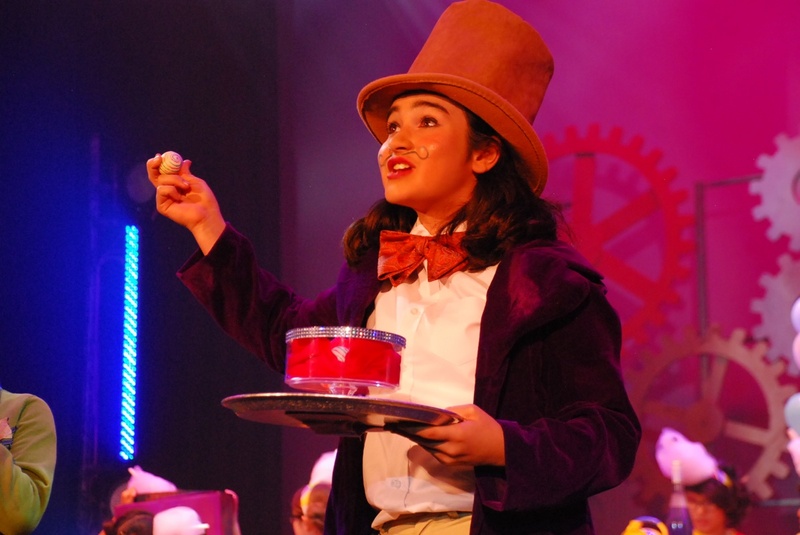 When all are on stage with the full, fabulous chocolate factory set, it’s a feast for the senses and pure joy to behold. 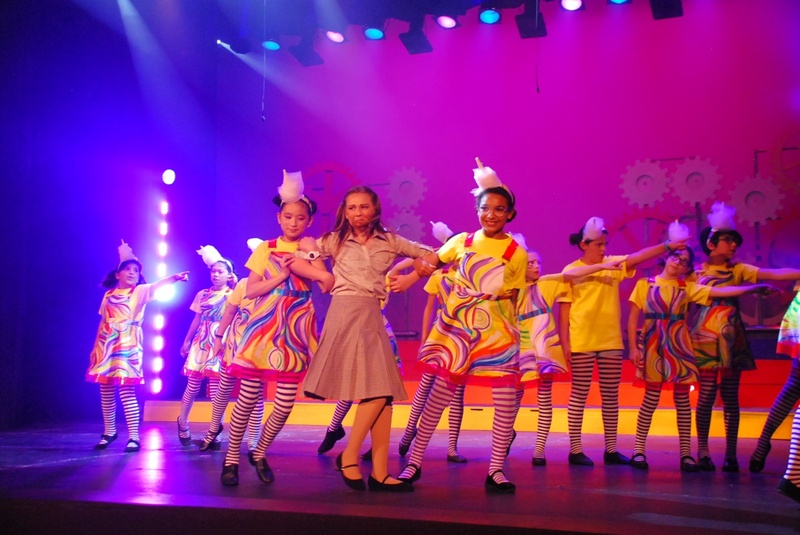 It was a standing ovation on Opening Night which will surely be repeated for the next three shows. If you don’t have a ticket yet, they are available at the door which opens 45 minutes before curtain. 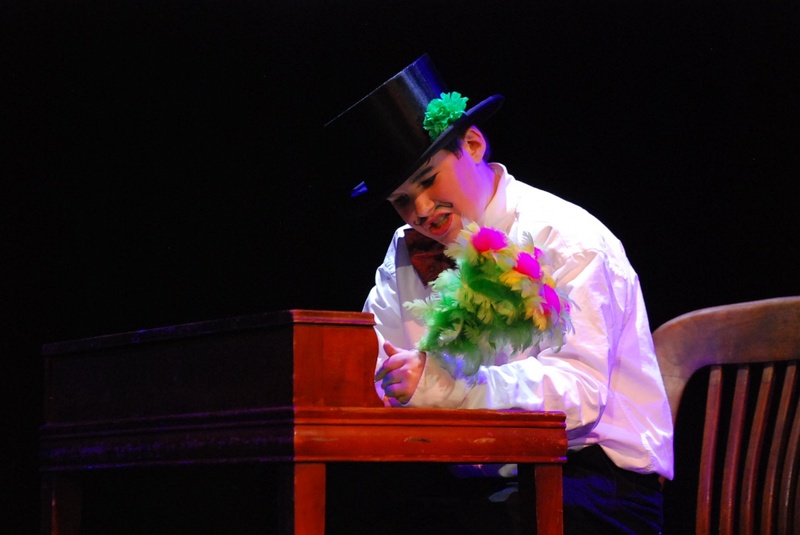 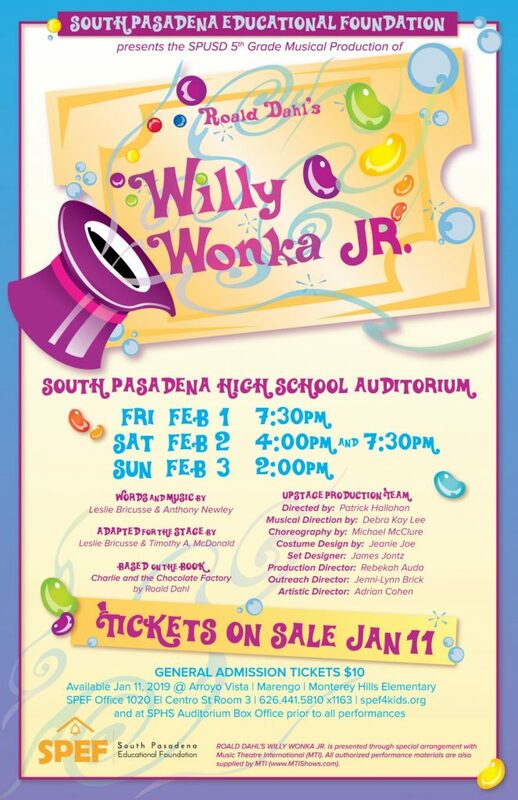 Showtimes are Saturday at 4pm and 7:30pm with a final show on Sunday at 2pm at South Pasadena High School auditorium. Congratulations to all the entire crew, SPEF, all the tireless volunteers and most of all to the terrific cast of Willy Wonka! PHOTO: Peter Wilson | SouthPasadenan.com | Willy Wonka Jr.
PHOTO: Peter Wilson | SouthPasadenan.com | The cast of Willy Wonka Jr.
PHOTO: Eric Fabbro | SouthPasadenan.com News | Wonka Jr.